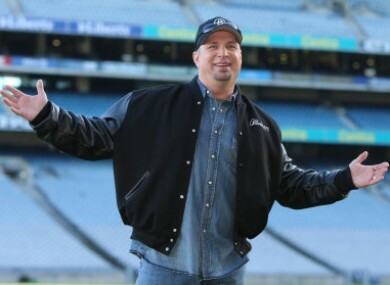 COULDN’T GET YOUR paws on a pair of tickets to see Garth Brooks in Croke Park? Never fear. Stena Line is here. The company is offering Brooks fans to join them on a Garth Brooks Tribute Cruise, which will sail from Dublin to Holyhead on Friday the 9th of May. For €45, Stena Line says passengers will be treated to “an evening of brilliant entertainment on board with out Garth Brooks tribute act”. Enjoy a collection of Garth Brooks hits from the brilliant Jason Hughes accompanied by live music from The Miracles, on this non-landing entertainment cruise departing from Dublin Port. The Stena Adventurer will depart for Holyhead at 8.30pm, but those on board won’t actually be allowed to leave the ferry when they arrive at midnight. However, with a full evening of cabaret courtesy of the man they call “Ireland’s Garth Brooks” on offer, we’re sure the die hard fans won’t want to get off the boat anyway. Here’s Jason Hughes in action. There will be a two hour stop at the Welsh port before the good ship Garth sets sail again, bringing them home to Dublin for around 6am on Saturday May 10th. Tickets for Brooks’ five Dublin concerts sold out in a matter of minutes earlier this year, with the people of Ireland spending about €28 million to go to the gigs. If you missed out and don’t want to find yourself standing outside the fire again, head on over to StenaLine.ie for all the details. Email “Stena Line is running a special Garth Brooks Cruise”. Feedback on “Stena Line is running a special Garth Brooks Cruise”.